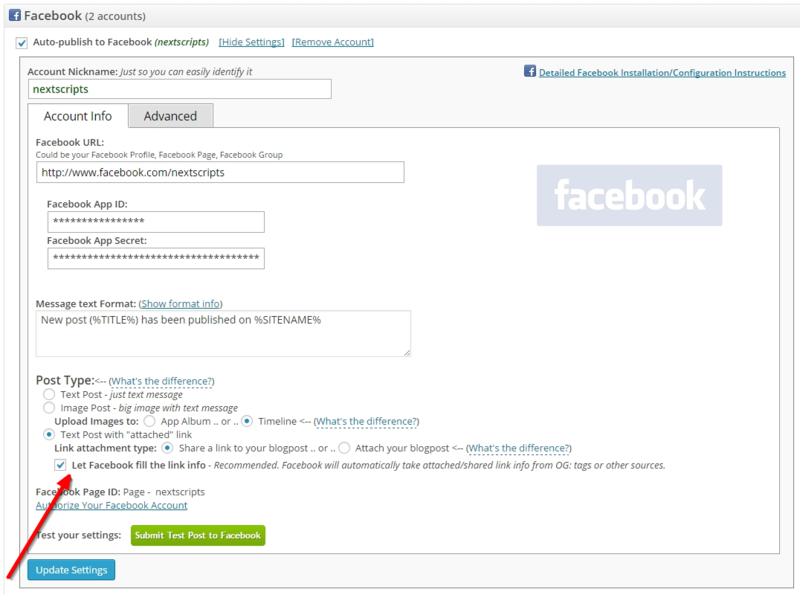 Please temporary deactivate “Google Analytics” and/or all other plugins (“Blog Promoter”, “Tweet Old Post”, “Simple Facebook Connect”, “Evergreen Post Tweeter”, “Simple Twitter Connect” etc.. ) related to “Social Networking”, do all authorizations and then activate them back. Even some versions of Woocommerce could cause this. If image is set, you can have some kind of protection on your images, (like “hotlinking” protection or unusual “User-Agent” header protection), you can have wrong URLs defined (like relative URLs like /img/mypicture0005.jpg instead of full URLS like http://www.nextscripts.com/img/mypicture0005.jpg), also it could be your server’s DNS misconfiguration, which means your server can’t resolve itself and get the image. Please contact your hosting provider or server admin for additional info. If “Alternative Featured Image location” is set in the settings, plugin will take image from there. Plugin takes featured image from the post. if there is no featured image it will take the first image from the post body. if your post body has no images it will take the specified default image. 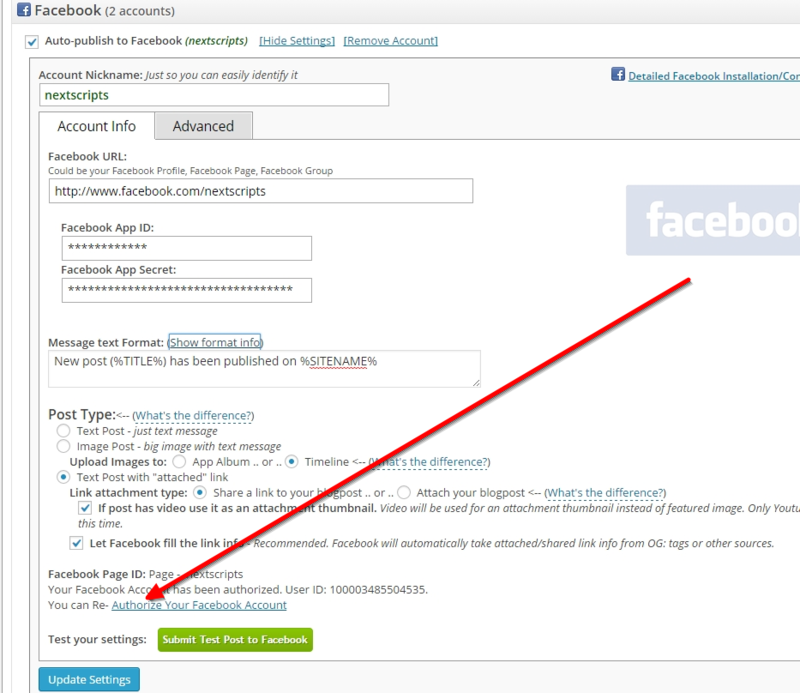 if default image is not specified it will take first image from the page. Please set featured image to clearly define what image you would like to show or specify Plugin Settings->Other Settings->”Open Graph” Tags->Default Image URL for og:image tag for the default image. Important! Some networks (like Google+ and Stumbleupon) ignore all your image settings and take the image specified in the og:image tag, so please make sure this tag is set as well. Update: Facebook is showing the wrong image? Plugin asks the server system to get it the writable temporary file by calling standard PHP function “tmpfile()” (http://php.net/manual/en/function.tmpfile.php). This function suppose to make writable file in your system defined temporary folder. SNAP is setup correctly and it makes posts to my Facebook, but those posts are not showing up in the newsfeed. Only I can see the posts, none of my friends do. Several reasons could be responsible for this. It could be your default privacy settings, your app could be “Sandboxed”, your posts could have low priority, etc.. 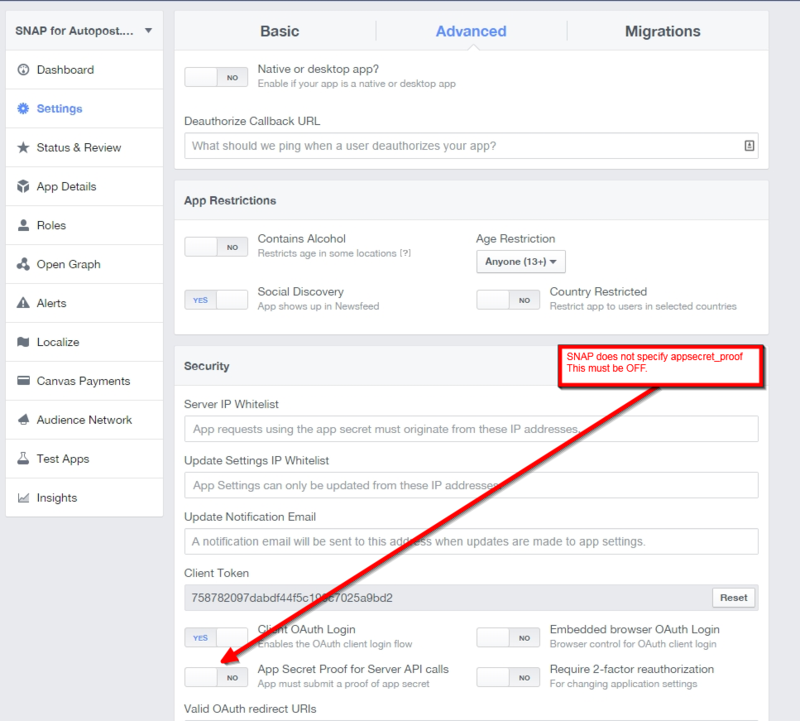 This error means that URL and Domain in your Faecbook App don’t match your actual URL.it is very important that URL and domain in your Facebook App match your WP-Admin URL and domain. 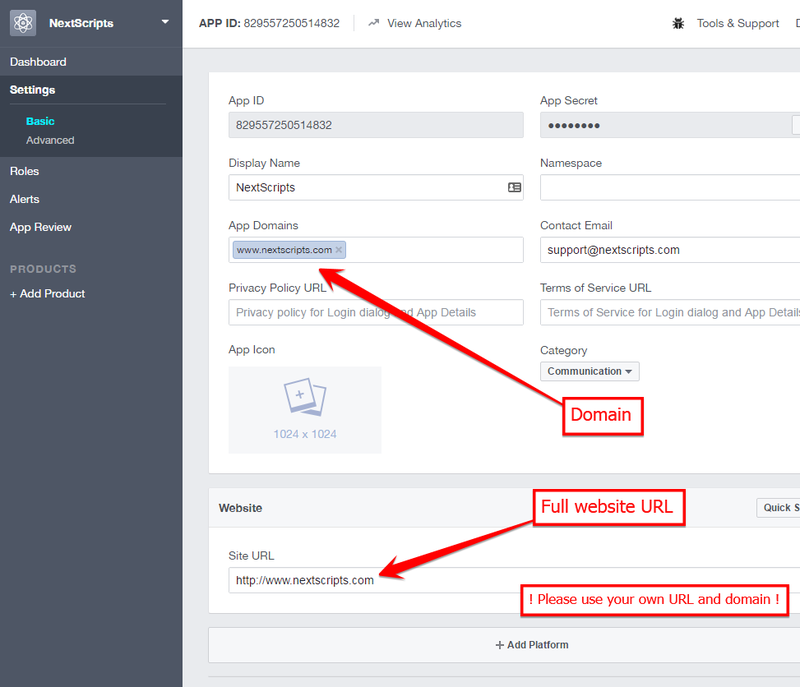 You must enter the URL and domain that you see in your WordPress Admin Panel. For example even if your visitors come to your blog at http://blog.nextscripts.com, but you manage your blog from http://www.nextscripts.com/blog/wp-admin/ – you must enter http://www.nextscripts.com/blog to the URL Field and www.nextscripts.com as the domain. Also please note that Facebook distinguish www. 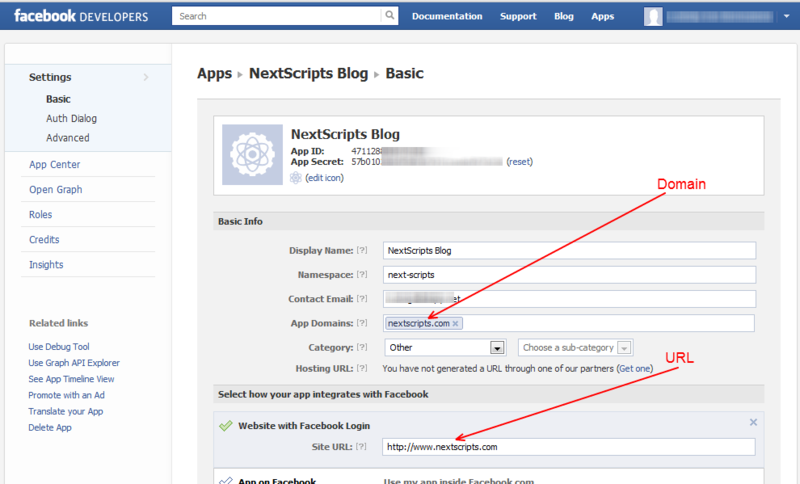 and non-www versions, so from Facebooks point of view nextscripts.com and www.nextscripts.com are two different domains.For your convinience, plugin shows your URL and Domain at the Facebook settings section. Select “Set your own” in the “What should fill attachment info” section and put %RAWEXCERPT% in the “Attachment Text Format” field. The same solution goes the LinkedIn, VK.com and other networks that support posts with attached links. 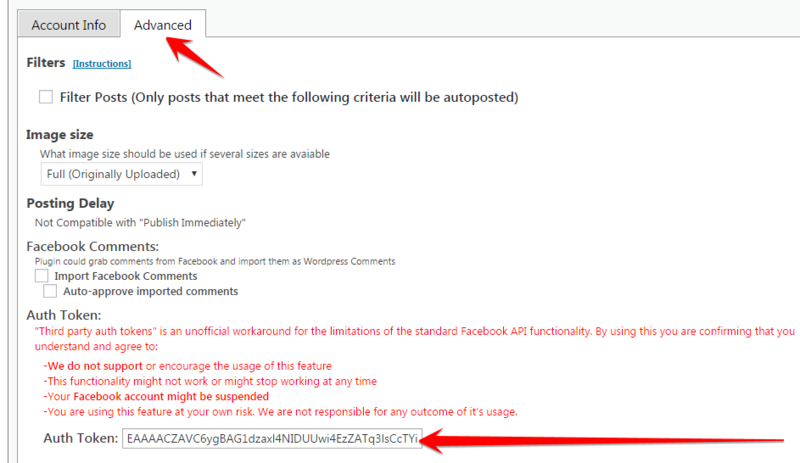 Go to http://www.facebook.com/twitter and remove the link to twitter from the affected wall (Click on “Unlink from Twitter”). SNAP can post to Facebook Profiles, Facebook Pages and Facebook Groups. You must be an admin of the page to post there. You must be at least a member of the public group to post there. You must be an admin of the closed or secret group to post there. for example: <meta property=”og:image” content=”http://url.of.your.image.jpg” />SNAP for WordPress plugin has built-in support for OG: meta tags: Plugin Settings->Other settings->”Open Graph” Tags-> Add Open Graph Tags It’s very basic, but it should work. There are several plugins specifically for OG: tags and almost all top WordPress SEO plugins have ability to add them. Pinterest Error: 502 Oops! | Our server is experiencing a mild case of the hiccups. | We’ve reported it to the team. | Try again?. Pinterest uses this error when it doesn’t like the content that you are trying to submit or when something is down/broken on Pinterest.com.Please check that your image URL and link URL are correct and valid. Please make sure that your image does not contain adult, abusive or any other disallowed on Pinterest.com content. Please make sure that your image description does not contain adult, abusive or any other disallowed on Pinterest.com content and your description does not appear as spam. We really can’t know why Pinterest doesn’t like your content, there is not further info available. 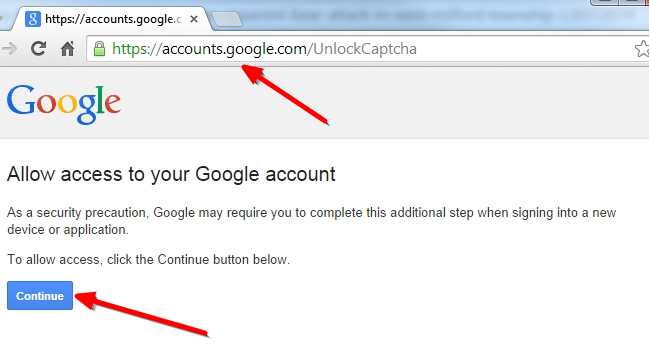 http://www.scoop.it/u/username is your user(profile) URL. Scoop.It does not allow any postings to be made to user URLs, you can only post to “Topics”. Please check your account, you have topics (like http://www.scoop.it/t/topic-name), so you need to enter topic-name to this field.